Yakgwa is a traditional Korean sweet, and it's usually shaped into some sort of flower design if you're buying it in a store. 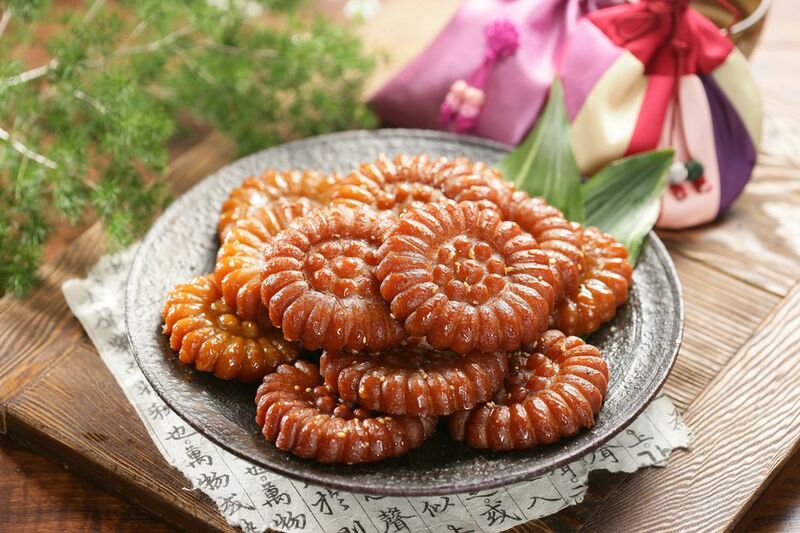 It's deep-fried and very sweet, so it's more of a dessert than an everyday cookie, and it was traditionally served at ceremonies, celebrations, and on special occasions. Yakgwa literally means medicinal confection, as 'yak' means medicine and 'Awa' means confection/sweet. The medicinal part refers to honey, an important part of traditional Korean medicine. Cut dough into one-inch strips to make diamond or rectangle shapes. Or cut into a flower shape. Bring a sturdy, flat-bottomed fryer or saucepan with oil, making sure the oil doesn't go higher than half the height of the pot. In small batches, drop pastries in oil and fry, gently turning them until they puff and float (about 4 to 5 minutes).